Adds color and movement to the edges of streams and ponds, and other sunny areas that hold a lot of moisture. Elegant lavender, beardless flowers are mottled with lavender-purple, and perfect for cut-flower arrangements. Green, swordlike foliage adds vertical interest. Blooms in early summer. Grows 24-48 in. tall with an 18-24 in. spread. For best results, plant in humus-enriched, moisture-retentive, slightly acidic soil. 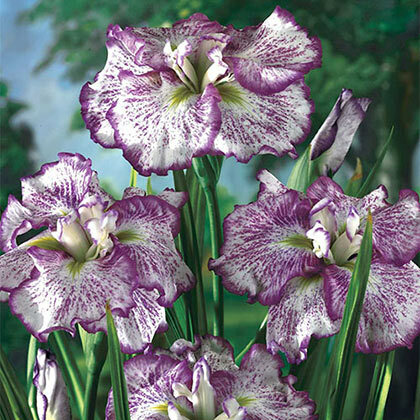 Geisha Girl Japanese Iris does not perform well in sandy soil. Plant in an area that receives full sun to partial shade. Zones 4-9. Bareroot. FoliageSword-shaped, green leaves grow to 24 inches long. Flower FormBeardless flowers with mottled veining of lavender and purple. Soil RequirementsHumus-enriched, moisture-retentive, acidic soil. Dislikes sandy soil. PruningRemove spent blooms to keep the plant attractive. Allow leaves to turn brown before removing them. Remove dead leaves in spring, before new growth emerges. CommentsBeardless, lavender blooms flutter like butterflies in early summer above attractive, sword-like foliage. Flowers have a gorgeous mottled veining of lavender and purple. Plant near the water's edge or add color to an area of the landscape that tends to hold water. When not in bloom, the vertical foliage remains attractive. Enjoy in a fresh bouquet. 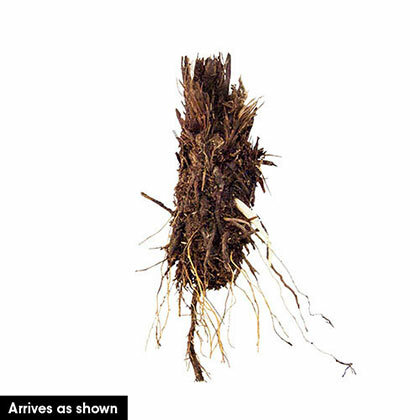 DepthPlant the rhizomes 1-2 inches below the soil line.